Did backward castes and adivasis really benefit from the Budget? Delivering the 2016-17 Budget speech, Union finance minister Arun Jaitley said the government will partner with Dalit Indian Chamber of Commerce and Industry (DICCI) to set up hubs for entrepreneurs from the backward classes. While Rs 62,838 crore have been allocated for Scheduled Caste and Scheduled Tribes from the total budget outlay, a sum of Rs 500 crore has been allocated to the government’s Stand-Up India scheme in the Budget to encourage startups by women, Scheduled Caste and Scheduled Tribe (SC/ST) entrepreneurs. “This must become the year of entrepreneurship for SC/ST and this will benefit 2.5 lakh entrepreneurs,” Jaitley said in the speech. Even as some Dalit and adivasi organisations welcome the move to encourage entrepreneurs from these communities, funds, they say, still fall short. According to the guidelines for budgetary allocation to Special Component Plan (SCP) for Scheduled Caste and Tribal Sub Plan (TSP) for Scheduled Tribes, 16.6 per cent for SCP and 8.6 per cent for TSP from the plan outlay should have been made. "As per the Supreme Court guidelines, budgetary allocation should be proportionate to the SC and ST population," says Umesh Babu, an independent researcher with Delhi Forum, a Delhi-based non-profit. However, just like the previous year’s budget, this year’s budget also falls short of meeting those requirements. This year, the total plan outlay was Rs 5.50 lakh crore, of which Rs 38,833 crore have been allocated to SCP with proportion of 7.6 per cent, while Rs 24,005 crore was allocated to TSP which is only 4.36 per cent. Further, activists say that the funds rarely reach the targeted population and are used to provide benefits to everyone. They have also questioned the previous Budget’s allocations to Scheduled Castes and Scheduled Tribes. Central budgetary assistance to the states are provided through two schemes—Scheduled Caste Plan (SCP) and Tribal Sub Plan (TSP). In the last budget (2015-16), it was announced that Rs77,236 crore will be allocated to Scheduled Castes, while Scheduled Tribes would get Rs40,014 crore. However, a pre-budget memorandum submitted to the Finance Ministry this year by National Coalition on SCP and TSP Legislation, a Delhi-based rights groups that tracks budgetary provision for backward classes, found that only Rs30,851 crore was allocated to SCP and Rs20,000 crores to TSP as per the revised estimates. Of this, only Rs8,793 crore was directed specifically towards the development of dalits, as per the guidelines of the Planning Commission, while Rs7,399 crores was directed to ST. Moreover, 60 per cent of the funds for TSP were under ‘general allocation’ while in the case of SCP, it was 65 per cent for the fiscal year of 2015-16. General allocation is meant for the entire country and not just for SC/ST population. 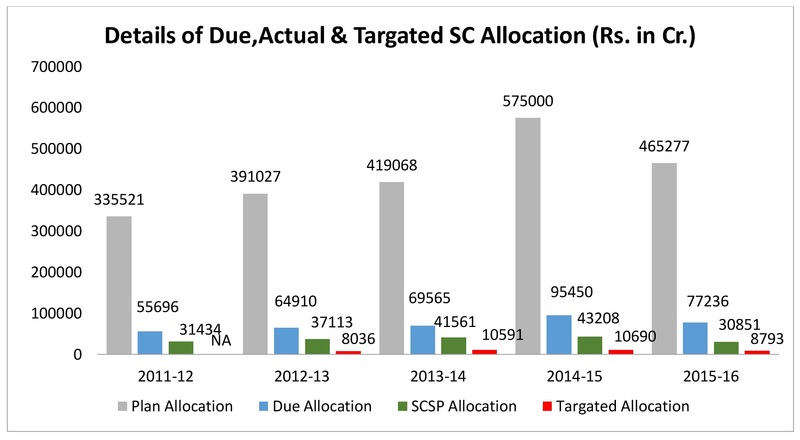 The report found that 28 per cent of SCP and 37 per cent of TSP allocation are targeted allocation, which benefits SC/ST directly. When all ministries are supposed to allocate funds for TSP and SCP only a handful do so. For instance, the Ministry of Tribal Affairs allocated 100 per cent fund to Scheduled Tribes under TSP and 12 departments/ministries allocated 6-11 per cent funds in 2015-16. But other important ministries/departments, such as the Ministry of Panchayati Raj, Ministry of Power, Department of Telecom, Ministry of New and Renewable Energy, and Ministry of Mines made no allocations under TSP. Similarly, of 108 ministries and departments only 23 made allocations to SC under SCP (these exclude allocations for Daman and Diu). In terms of percentage of allocation, Ministry of Social Justice and Empowerment has allocated the highest (79 per cent) while the lowest allocation is by the Department of Electronics & Information Technology (2 per cent). The Ministry of Housing & Urban Poverty Alleviation, Ministry of Panchayati Raj, Department of Industrial Policy & Promotion, and Department of AIDS Control had no allocations under SCP in 2015-16. Direct Benefit Schemes, which have been hailed for their reach, too, do not really work in uplifting the status of ST/ST in the society. The memorandum observed that most of the direct benefit schemes are for survival, and not for development or empowerment of SC/ST. “Survival implies that the schemes are only catering to the basic needs like nutrition, or just an adequate standard of living rather than focus on rural development; agriculture and allied services, industries and mineral, science, technology and environment and transport,” it states. According to the lead researcher of the study, Paul Divakar, around 70 per cent of the allocations are used for the sustenance and only 27 per cent for the development of adivasi/SC/ST. Divakar says that not just the present Modi-led administration but even the previous regimes followed the same policy towards these scheme, as was noted by the Comptroller Auditor General of India in 2007.